The ultimate practical reference tool for home design and decoration, Step by Step Home Design & Decorating is the only book that does everything step-by-step. When it comes to restyling, redecorating, and sprucing up your home, the big question is where to start. From the planning stages through the finishing touches, everything you need to know to give your home a complete makeover is in Step by Step Home Design & Decorating. Comprehensive in its scope and utterly practical, Step by Step Home Design & Decorating is an indispensable single-volume reference for anyone restyling their home. Theme tips: “5 ways with rugs” and “10 ways to refresh an old kitchen,” etc. My mom is amazing at decorating. When I lived in Ontario, she was the one who helped decorate the rooms in our home. In fact, people even hire her to makeover rooms. It’s definitely her calling and I wish I had her talent and expertise in that department. I’m learning though! I’m living in Nova Scotia and my mom is too far away to come by and help me decorate this house. We are renovating/redecorating just about every room in our home and I’m pretty much doing it on my own. I feel so lost at times! I’ve got an excellent resource now to help guide me through the process. 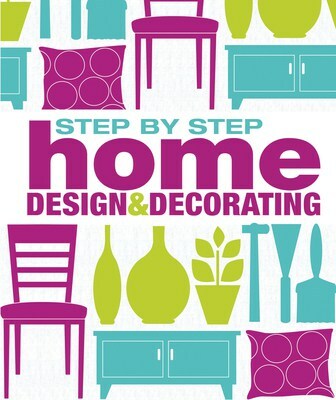 I’ve been perusing Step by Step Home Design & Decorating from DK Publishing and it’s exactly the help I need. If my mom can’t be here to help, it’s the next best thing. The book is divided up by room and discusses just about everything you could think of for design and decorating on all types of budgets. In the Kitchen chapter, the author discusses what to do when renovating your kitchen and the order to do it in. We’ve are about 3/4 way done our kitchen reno and did not follow the order suggested. I think it would have saved us a few headaches if we did! I like the idea of creating a mood board around the room you are going to be redecorating. You could easily do one on Pinterest or the old fashioned way by cutting pictures out of a magazine and pasting them on some bristol board. I think for my next project I will make one. I also learned about the perfect kitchen work triangle to make your kitchen the most functional. For my next kitchen reno, I’m definitely consulting this book! It also goes into detail on backsplashes, cabinets, countertops, sinks, appliances and more. Other chapters I found very helpful was on Bathrooms. Our upstairs bathroom is about 1/2 way complete and we haven’t even attempted the main floor bathroom reno yet. This chapter talks about choosing a toilet, faucet, flooring, bathroom storage and more. You’ll also find information on Living Rooms, Bedrooms, Hallway, Home Office, Laundry Room and Outside Space. It’s written in a way that’s easy to follow and understand and you don’t need to be a carpenter or interior decorator to understand. In fact, I was engrossed reading through the book since I’m obsessed with watching DIY shows on HGTV. I love seeing rooms transformed from something old and ugly to new and beautiful. This book just explains the “how” and “why” of the various elements in your redecorating/renovation project. There are some photographs, but most of the book displays illustrations of each topic. It clear and easy to visualize whatever is being discussed. Pictures are a must for a design book in my opinion! If you are interested in home decor and wanting to redecorate or renovate a room in your home, pick up and read this book first before you start! At least now I’ll know what to do on my next house right? Vote for Me in the MiB Awards! Sounds like it might be a good book to get my friend for Christmas, she has been talking a lot lately about starting to redecorate her house. Thanks for the review. When it comes to redecorating, I’m not very good. This is the kind of book that would really help me. I really want to redo the bathroom and would love some ideas. I see Amazon has some used books pretty cheap. Home design and decor is something I’m very interested in, so I’ll have to look into getting this book for myself! This sounds like a really good book for beginners like me! Oh my. I think I’ve just found a Christmas gift for someone! Wow it really does cover the basics of home deocrating with some how to as well. Cool book for those of us who are not Martha Stewart. nice book…..Id like to re-decorate my apartment. Paint,re-carpet I just need to wait. Id like to re-decorate my basement.